Carlton lost to South Melbourne by 41 points at Lakeside Oval. Goalkickers: A.Clarke 3, K.Shea 3, F.Anderson 2, R.Cooper 2, M.Crisp 2, H.Vallence 2, H.Bullen 1, J.Cooper 1, G.Dougherty 1. Reports: Injuries: A.De Luca (bruised thigh) replaced by G.Dougherty in third quarter. H.Vallence (strained knee), K. Shea (leg), Gill (leg), Johnson (leg). An amazing 3rd quarter burst of 13 goals from the "Foreign Legion" completely swamped the Blues who had led narrowly at the half. Bob Pratt again demonstrated his dominance over the Carlton backline with his 3rd successive double-figure haul (including a freakish 8 in that 3rd term) against the men from Princes Park. In doing so he broke through the 100 goal barrier for the season in Round 13!!! Pratt was on his way to a scarcely-believable 150 for the year, a mark equalled by Hawthorn's Peter Hudson in 1970 but never bettered. With only six rounds of the season remaining, Carlton needed to win against the strong South Melbourne outfit to stay in the finals race. Carlton’s form had been good leading up to the game, and the Blues were confident of a good showing, but their prospects were hampered by their list of injured or unavailable players, including top liners Davey, Cashman, Mackie, Hale, Pollock, Dunn and Maskell. The task would be difficult. Three changes were announced on Thursday evening. Keith Dunn was out with torn stomach muscles and Frank Finn and Wally Mutimer were omitted. Inclusions were Mocha Johnson, Joe Kelly and George Dougherty (as 19th man). The game was Frank Gill's 100th. In light rain, South Melbourne won the toss and kicked to the lake end goal. South were into attack straight away and Francis repelled two early forays. From one, the ball went to Crisp who passed brilliantly to Vallence but his set shot went astray. South, playing well, peppered the goals but ten shots resulted in only five behinds. De Luca, Francis and Huxtable were all defending resolutely. The conditions were greasy, which was not suiting South’s pacy style. Carlton, settling in, now provided a great burst of football with four goals coming in an eight minute period. First, Clarke ran in and goaled, then Ogden assisted Ron Cooper to snap the second. The third goal came via a long punt from Anderson, followed by Shea and Bullen combining to assist Ron Cooper score his second. The Blues were playing with a purpose and led at this stage by 20 points. Two goals to South gave them some badly needed respite, but Crisp snapped a goal from a pack just before the bell to give Carlton a 14 point lead at the first break. Five minutes of tough, hard football were played before South Melbourne opened the scoring in the second term. Using their pace, the Swans kicked three goals in five minutes to take a five point lead. Carlton, not rattled, steadied and Bullen got the ball to Vallence, who cleverly passed to Ogden which resulted in Crisp goaling from a free kick. Bullen was involved in the next rally and worked with Ron Cooper to allow Clarke to kick Carlton’s seventh, after some fine shepherding work. South responded with a goal. Carlton’s eighth goal came after Shea passed to Vallence who kicked truly with a long snap. Carlton was on top, winning in the ruck. Further attacks resulted in two more goals. Ogden, playing well, kicked to Jack Cooper who ran a full 15 yards into goal for the ninth, and Bullen snapped a nice goal after fine work in the forward pocket. Carlton were again out to a twenty point lead. With Bullen spelling, South rallied and kicked two late goals, one from a doubtful free, to close the gap to eight points at half time interval. It had been a fine half of football, with Carlton’s best being Francis, Bullen, Ogden, De Luca and Crisp. A new ball was used after half time. South commenced the quarter with two early goals to give them the lead. De Luca went down not long after the resumption with an ankle injury and was replaced by Dougherty. Carlton responded with clever work from Kelly and Ron Cooper, working together to get the ball to Anderson who took a towering mark. His 50 yard kick restored the lead. South Melbourne now produced possibly the finest quarter of football ever seen. Playing superbly, they dominated all facets of play with brilliant, exhilarating football, which left Carlton players lying in their wake. The Blues seemed powerless against such perfect play. Four South goals came in a furious burst before Carlton, attempting to rally, kicked two goals, to Crisp and Vallence. 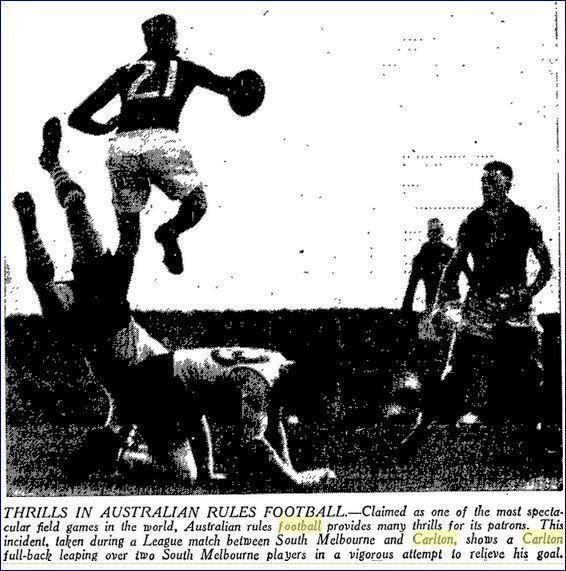 But South were unstoppable and they kicked a further seven goals to make their tally for the quarter thirteen, eight of which were scored by the champion Bob Pratt, who was simply unbeatable. His 100th for the season was one of them. Apparently, even Carlton supporters were applauding him! The three quarter time bell must have been a relief to the beleaguered Carlton players, who faced a 53 point deficit. As expected, Carlton refused to give up and battled on gamely in the last term. Ron Cooper and Shea worked well together to provide Dougherty with Carlton’s 14th goal. Sensing the game was well won, South seemed to relax slightly. Francis, still working hard, kicked to Ron Cooper who handballed to Shea for another Carlton goal. Shea followed up soon after with a great snap for goal number 16. South now attacked and Pratt brought up his 11th goal after a towering mark. Carlton was still trying and a free to Shea gave him his third goal for the quarter. A late South Melbourne goal just before the bell was their 23rd and last for the game, giving Carlton a 41 point defeat and a hard task to make the finals. Contributors to this page: Chicko , Jarusa , blueycarlton , pblue , Bombasheldon , timmyd , molsey , WillowBlue , kkk , camelboy and admin . Page last modified on Tuesday 12 of February, 2019 11:51:29 AEDT by Chicko.